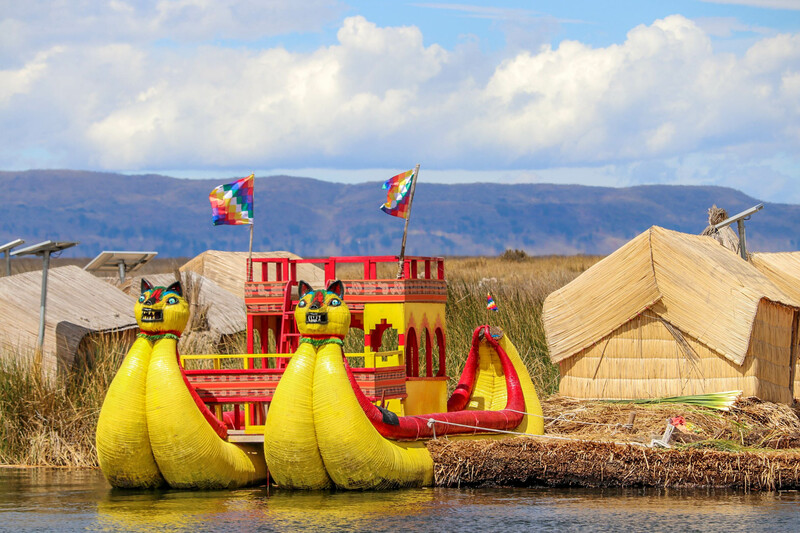 Lake Titicaca and the Floating Islands of Puno, Peru along with the Uros people, were one of the highlights of Peru. We like Peru, however the constant commercialization of the country was less in Puno... much less. This made walking down the street, (except for the walking street...still pretty hawkerish) actually enjoyable. We arrived on a night bus from Cusco with little sleep on the Bolivia Hop program we heard about. It's a good deal and the Bolivia Hop people will help you along the way. The bus itself is just as good as any of the other more expensive buses we have taken, however, they have their schedules and amenities down pat! They even offered us a reasonable and cheap breakfast in Puno when we arrived, drove us to the Cozy Hostel where we were staying, and you have the ability to change your ticket and date of the next leg on their website with ease. We highly recommend Bolivia Hop and Peru Hop if you are traveling around South America. However, we didn't end up using their services anymore. More on this later on in the article. 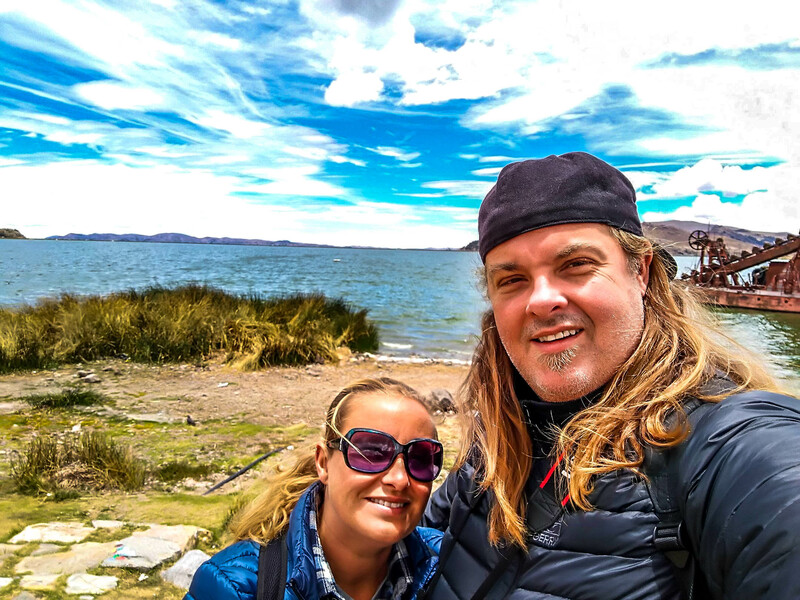 For now... let's talk about how amazing Lake Titicaca is and how much we enjoyed relaxing in Puno at 12,500 feet above sea level. Puno is a city in southeastern Peru, located on the shore of Lake Titicaca. It is the capital city of the Puno Region and the Puno Province with a population of approximately 149,064 (2014 estimate). The city was established in 1668 by viceroy Pedro Antonio Fernández de Castro as capital with the name San Juan Bautista de Puno. There is less than two miles of flat land between the shores of the lake and the foothills of the surrounding mountains, which has caused the city to continue to expand upwards onto the hillsides. As a result, the town's less developed and poorest areas, which are high on the hillsides, often have very steep streets, which are generally unpaved and cannot be accessed by automobile. Puno's access to Lake Titicaca is surrounded by 41 floating islands. To this day, the Uros people maintain and live on these man-made islands, depending on the lake for their survival, and are a large tourist destination. More on that later. Other than that, Puno was a place we could relax a little from the constant hawking that pervades Peru and it's tourism industry. Albeit the walking street had it's fair share of hawkers and over-zealous restaurateurs trying to pull you into their establishment. Most of the city was not like this however and made it easy to walk around unmolested, which we loved! The city itself is cheaper than other places in Peru. We were able to actually get decent meals for less than 5 dollars each and it had one of the best cafes we have been to in Peru. Rico's Pan not only has great food, it has excellent coffee. We loved our daily Mochaccinos at Rico's and highly recommend the Chicken Milanesa and Noodles with Huancaina sauce. So good... we ate there twice in 3 days. Another great thing about Puno, now that we are talking food, was the street food! We love us some street food, and Puno had some different stalls not seen in other parts. Of course you had your Anticucho stands (beef heart) but, there was also a fried-donut style thing we ate from a lady on the street. It was delicious. We wanted more, however didn't want to increase our belt size and blow our appetite. We also ate what can only be construed as a Peruvian Corn Dog. It was a hotdog that was put in a waffle iron type contraption and was really a cross between a corn dog and a waffle. Pretty good really. While walking the streets of Puno, we ran into so many cool things. One of which was a music video being filmed by a Bolivian Altiplano Music Band. There were people dressed in traditional attire dancing around while they played their song over a speaker, people lip syncing, drones capturing it, and us sitting right in the thick of it. We asked them if they wanted us to move. They said no, so I guess we might be in a Bolivian band's music video. It was really cool watching the dancers and film crew. We loved it. We love people watching and the best way to do it is on a walking street in Peru. We spent hours sitting on park benches in the Plaza De Armas, or in other plazas along the walking street, just sitting and watching others. I joked that all we needed was some bread crumbs and we would be like the old people who sit in parks feeding pigeons. 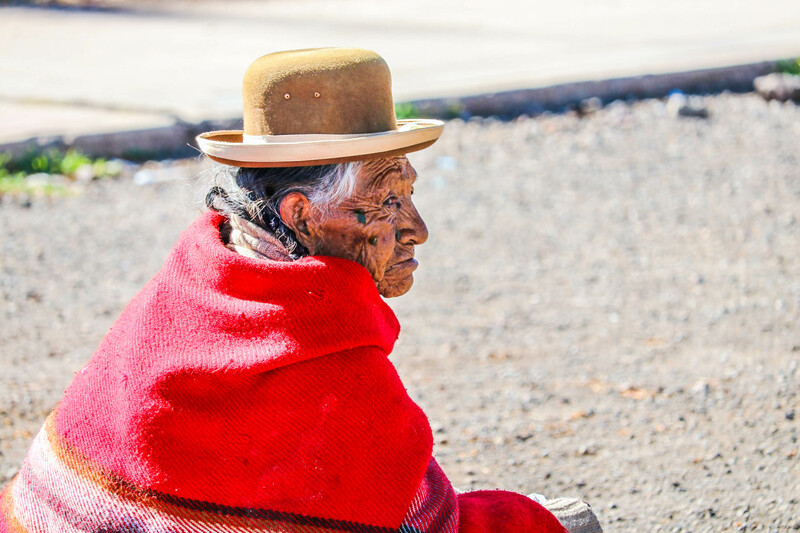 We enjoyed walking down the walking streets of Puno, however the restaurants are two to three times more expensive than one or two blocks away, and the constant hawking from vendors got old. We enjoyed it anyway and frequented the walking street daily. We really don't like tours! So if there anything we can do on our own, we are open to doing it. Organized tours just end up being a frustration for us in the long run most times. We saw that our hostel had a tour for about 50 soles per person. (15 dollars each). We didn't take the tour from our hostel and opted to walk down to the Port and dock to see if there was something we could do not tour related. While down at the dock, we found out that it's 10 soles each for the boat ride to the islands and 5 soles each for "park fees" to be allowed on the islands. You can do this through pretty much any boat operator at the pier and I am sure each operator goes to a different island. There are 41 in all, however I think there are actually more. So we hopped on a boat and headed out to the islands after it was full. We ended up sitting on the roof of the boat, as the inside was cramped and we wanted to see the sights. Through the filthy windows of the boat, even a picture would have been useless. We loved it! The skies were the bluest I have ever seen quite possibly. Maybe it's from the high altitude and thin atmosphere. Maybe it's the reflection off the greenish blue waters. Either way... it was breathtakingly beautiful on Lake Titicaca. The half hour boat ride got us to the shores of a floating village and as we arrived at the island we were going to visit, the locals pulled the boat ashore and all yelled something in their native tongue. We soon found out that this isn't an authentic island but, a visitor island that is used to show tourists what life might be like on the islands. We were given a spiel in spanish and allowed to walk around the small island. We learned a lot from going to the island. As we sat listening to the presentation, they showed how they built the islands. They said the root system of the reeds actually floats. So they cut them into blocks then tie them together. After that, they cut down reeds and lay them in bunches one way, then the next until it creates a platform. Each island has a life of 20-30 years before the roots die, and the island sinks. It was spongy to walk on and once getting off the boat, it seemed if we were walking on some sort of wet sponge... strange really. Although we didn't get wet, just below the dried reeds, lies a layer that is wet. There was a fishing hole in the middle of the island to catch fish and draw water for cooking. The cooking arrangement was a little different. It was a clay oven that sat on a stone platform. They said it was necessary so that they didn't burn down their homes and island. We were also showed some of their homes and how they lived. Now days, they have solar panels on the islands that power their homes and television sets. However, most people on this island were probably from Puno and commuted to work daily to "play indigenous" for us tourists. The more we listened to the presentation, the more eye rolling happened. Although it was interesting, it really was just a sales pitch for their handicraft market setup. All mass produced and nothing made by them. It was the same stuff we saw all over Peru on every walking street and trinket shop. Overall it was cool. They asked us if we wanted to go on one of their reed boats. Another 10 soles and we could. We declined and took our taxi boat from the pier to the same island all the other gringos went to on the reed boat, a little later. Funny thing was, it was towed by a motorboat, not rowed or pushed with a pole like the "real indigenous" do it. Once getting to the second island, we saw how the real Uros do it now. Tin sheeting for walls and roofs, solar panels, water tanks, bathrooms, restaurants with real stoves etc. This was a place to eat and get some "authentic" ceviche from the lake. We declined to do this too. Total cost of our excursion for 3-4 hours was only 15 soles each... less than 5 dollars. We really enjoyed our day on the lake however and beauty of the lake and the reed islands, isn't really evident in pictures. You really have to see it yourself to understand how incredible this lake really is. When we were done with our tour of the floating islands, we walked past the paddle boat docks. 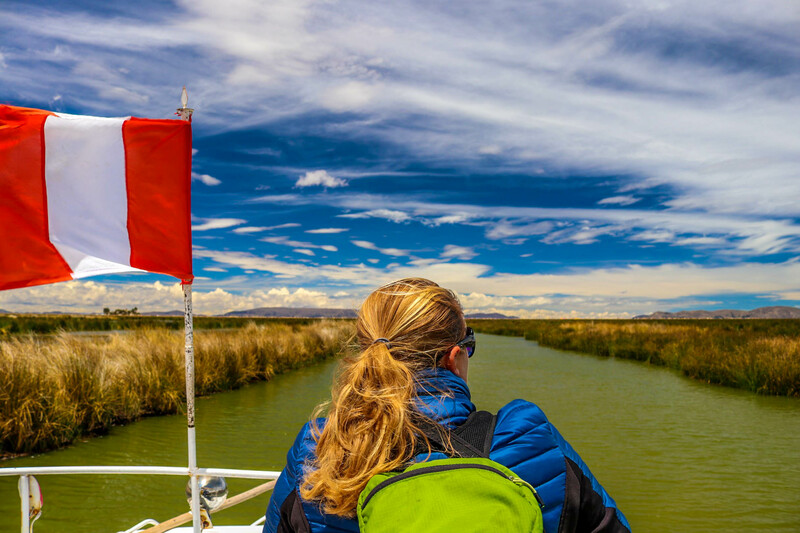 For just 15 soles per hour you can paddle around the lagoon on the banks of Lake Titicaca and we couldn't wait to do it. The following day it was warmer than it was the day we went to the floating islands and we headed back to the marina, lighthouse and pier to take a boat for a spin. We chose the fish boat because it was the only one with a tail and had a bench seat. We paddled out in the water, enjoying the day in our rickety fish. There were tons of water fowl, seagulls, loons, and other sea birds swimming around. The views of the surrounding city, lake, and marina were great! Whenever we get the chance we like to take out the "swan boats". 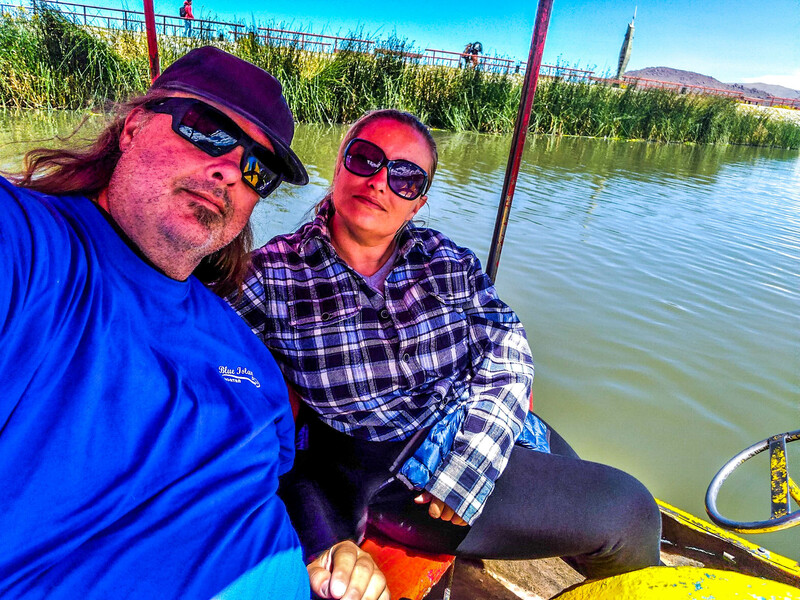 It's a lot of work to make them go, and the steering was horrible, but we really enjoyed being out on a sunny day and it was highlight of our time in Puno. If you go to Puno. Don't just stay a day and leave. Explore this city some. It's got a lot more than you think it will and it ended up being one of our favorite stops in Peru. Sure there aren't sprawling ruins and sandboarding, nor does it have the 5 star restaurants that Lima does or the history of Arequipa. What it does have is an authentic experience of what Peru really is. A nice country with some cheap things to do. So as we sat in Cozy Hostel (which by the way, is a great place to stay!) speaking to other travelers who had issues at the Bolivian border. We came to the conclusion, one bus trip from Bolivia, and literally across the lake, not to go to Bolivia. Thinks change on the road in an instant. We won't regret it and feel it's the best decision. Why you ask are we not going to Bolivia? It costs American's 160 dollars for a visa: No, no and no. We are not paying this price for Bolivia. It's a principle thing more than anything. They charge it to Americans because Americans charge it to Bolivians when they come to the USA. You must have a recent Yellow Fever vaccination: No, no and no. Not going to get one to visit Bolivia. Not a big fan of vaccinations... and yellow fever... however horrible it would be, I am pretty sure, I am not spending time in the Amazon of Bolivia where it might be a problem. They want bank statements and credit card statements: All of them!!!! You must print out and show them you have money in the bank and how much debt you have. This is Bolivia right? I can understand if masses of people are trying to live in Bolivia, the government wanting to see if people who show up, actually can stay there and pay their way. But come on, this is Bolivia. Bolivia requires a plane ticket out or itinerary of where you are staying and how you are going to leave the country: We don't even know where we will be day-to-day, let alone in a month after visiting. Please!!!! Who do you think you are Bolivia? Again, are people running to Bolivia to stay there permanently? I think not. There really isn't anything in Bolivia we want to see or MUST SEE: Iguazu falls... must see, Patagonia... must see, Galapagos.... must see, Colombia... must see and do. Bolivia....nada... nothing. There is trekking, altitude, and some salt flats. Hmmmm.. already seen salt flats, and once you have seen one... you have seen them all. Trekking... nope. Neither of us are trekkers. Altitude... nope. We are sick and tired of being sick and tired... and cold. And finally all the restrictions to American travelers, simply makes it a place we don't want to visit. We have been on the road for a month and have pretty much worn the same "warm" clothes over and over. It's why you see pictures of us wearing the same thing all over Peru. We need warmth and sunshine, and ground level altitude. Not more of the same with a high price tag to enter, over watched once we get there, financial spying at the border, not to mention, terrible bus system, roads and who knows what else. We have heard it's cheap in Bolivia. However, we have learned over the years, sometimes you get what you pay for. We are heading to Chile instead where it's expensive. So for now... goodbye Peru! Hopefully, we get what we pay for in Chile. Peru is a beautiful place to go, I have heard alot about Peru but never got the chance to go there. Thanks for sharing this and the amazing pictures. You are welcome! I hope you do get to go. IF you do, get in touch and we will be happy to direct you to places not shown on the site.